Its time to get artsy fartsy! 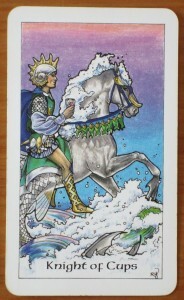 The Knight of Cups is all about following your heart and honoring your inner creative. Get your feet wet and do something arty – go to a dance class, make a collage out of magazine clippings or, if your really crazy, paint a mural on your bedroom wall. Don’t be afraid of making a mess today. In romance, this Knight of Cups encourages you to wear your heart on your sleeve and just go for it. You may regret it later, but not as much as you will regret holding yourself back. If you have the opportunity to travel or go on some kind of adventure this weekend, do it! It will help you charge full steam ahead toward a life that enchants and thrills you. This entry was posted in July 2013 and tagged daily tarot reading, how to read tarot cards, knight of cups tarot card, one card tarot reading, robin wood tarot, tarot card meanings. Bookmark the permalink. Tomorrow (okay, a day late, what can I say? ), I’m headed out to facilitate a Knight of Cups-esque day of creative writing fun for a local writing group. But TODAY, I’m going to go settle in and get very playful and creative (per your instructions) with my prep for that workshop. Heck, I might even include a box of Crayola crayons in the mix. Jamie – that sounds like a crapload of fun fun fun! Go to town with those Crayolas for me! LOL. I like doing that too, sometimes! This says it all! Just let loose without fear. Thanks again Kate,your light hearted approach is lovely.